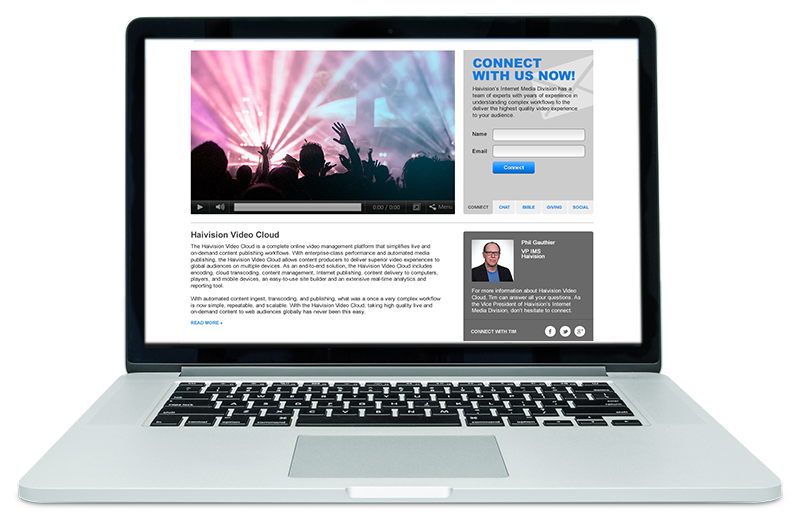 Whether broadcasting a live event to connected audiences around the world or publishing on demand video across internal portals, company websites and mobile applications, the Haivision Video Cloud is a cloud-based video content manager that provides you with the tools you need to get the right content, to the right audience, wherever they are. To extend your ministry to viewers online, the Haivision Video Cloud gives congregations a fast, simplified, end-to-end solution by providing a reliable, automated ingest, transcoding and publishing platform for live and on-demand video with powerful analytics to monitor audience engagement and video performance. Haivision works with you and your organization to create “set and forget” publishing workflows, all from within a comprehensive and intuitive web-based video content manager. The Haivision Video Cloud distributes your live and on-demand video across multiple websites and social media platforms simultaneously, giving you more time to focus on content creation, leaving the heavy lifting to us. Smart publish profiles automate the delivery of content to websites, mobile devices, tablets and set-top boxes as well as leverage social media integration with Facebook, Twitter, YouTube and other outlets. To evaluate messaging impact, audience engagement and more accurately judge the performance of your video assets, Haivision Video Cloud features powerful analytics tools to give you unparalleled data access into the performance of your content. Haivision Video Cloud’s analytics tools help you to better assess your audience, and ultimately make sound, data-driven business decisions. With the Haivision Video Cloud Scheduler option, you can create simulated-live broadcast channel experiences by scheduling live streams and VOD content to play out at specific times throughout the day or continuously 24/7. For the most efficient and high quality delivery of your live video content to viewers on all devices, live transcoding is an essential part of your video delivery process. If you have live cloud transcoding needs, the Haivision Video Cloud offers multiple options – either with Haivision’s KB transcoder or a fully managed service – to ensure your audience gets the best viewing experience at all times. The Akamai network is seamlessly integrated into the Haivision Video Cloud for storage and transport of your video streams. With Akamai, your media is being served by a highly robust and reliable content delivery network (CDN), ensuring the media experience is fast and of the highest quality. Should you have an existing CDN provider, the Haivision Video Cloud can also easily take advantage of your existing storage and distribution platforms. Read more about the Akamai partnership here. Redemption Church Connects their Congregation with Live and On-Demand HD Video. Learn how Hope Fellowship grows its ministry with online streaming. Learn how Hill Country Bible Church extends their gospel to new audiences with DVR streaming.